Over in Nunavut right now, there's a bit of a fuss being made over comments by MLA Pat Angnakak which suggested that they'd be better off with fewer communities. It's too costly and impractical, she argued*, to provide adequate services to all those small towns and hamlets. Some people have drawn comparisons to Newfoundland's controversial resettlement programs of the 50s, 60s, and 70s. That was before my time there, but the legacy lingered and growing up in rural Newfoundland, I was certainly aware of it. Perhaps its subconscious impact on me is why I find the implications of Angnakak's comments really bothersome. I understand how costly it must be and I'd be in support of some sort of overhaul of the current way of doing business and I certainly am not suggesting there are easy answers, but I get more than a little offended when people don't seem to fully appreciate the cultural value of small towns. And Iqaluit, the capital of Nunavut stands at only 7000 people. Even if the rest of the territory got forced to resettle there, that would bring the entire city up to still less than 30,000 and they're still on an island in Canada's arctic. What would Angnakak advocate then, when it's inevitably discovered that the cost of doing things in the north is still outrageously expensive? That everyone gets shipped to Ottawa? I don't think so. I've questioned the reality of the slow, "inevitable," death of small towns before, but killing them outright is outrageous. What in the heck does all this political stuff have to do with a picture book about dragonflies? Very little, I suppose, but it was set in northern Manitoba where two brothers are exploring their summer home and there's is the only family in the entire place. Despite this, Joe and Cody are having loads of fun. 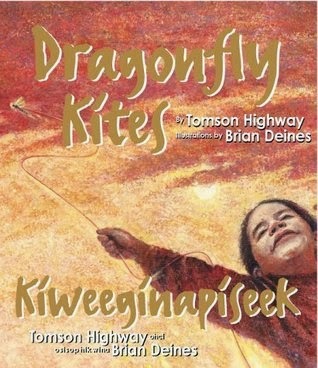 They make kites with thread and dragonflies. Their imaginations thrive. They remind me of form poetry. Where cities are free verse, rural Canada finds its creativity because of the constraints. But that they would not even view their home as constraining is a lesson that other Canadians are at risk of never understanding if we insist those places die. I was unaware of Newfoundland's resettlement program, but it certainly sounds ill-conceived, as does similar ideas about the north. The high cost of living in the north needs to be addressed, but herding people into a central location is not the answer. The book, though, sounds quite lovely.